Our cats will drink water from everywhere but their water dish. At least one cat also has the annoying habit of tipping over glasses of ice water and vases of flowers in order to get a drink. 1) I put floral arrangements only near sinks, for easier clean-up. 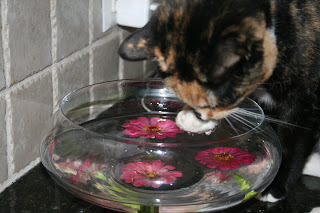 2) I created a kitty-friendly floral dish (see above picture). In the left corner, we have the defending champion, the Redneck Compost Pile. In the right corner we have the Urban Composter. Will the Urban Composter be quicker on its feet? Or will the Redneck Compost Pile win because it's in a different weight class? This should be a great fight! For those of you who missed my live interview yesterday on WYFF4, our NBC affiliate in Upstate South Carolina, it's now available anywhere you have an Internet connection. I was asked to share some general gardening tips and to dicuss what makes adjusting to Southern gardening so difficult yet so rewarding. You can view the first interview and second interview on the WYFF4 website. My garden tips are featured, along with the advice of six other garden bloggers who I really admire, in a recent article on wowOwow. 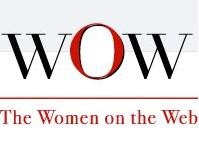 This is a website for women and written by women, founded by several famous and fabulous women including Whoopi Goldberg and Lesley Stahl, so I was honored to contribute! 1. What’s your number one gardening tip? 2. What is the biggest mistake gardeners make (that they don’t know they’re making)? 3. What are recession-friendly ways to enhance your home’s curb appeal? 4. What are your seasonal tips for summer, fall, winter and spring? 5. What is the best way to have a healthy “green” garden? 6. What are some fool-proof flora you can grow — even without a green thumb or time? 7. Does organic gardening have to be expensive? Those of you living in Upstate South Carolina or Western North Carolina, you can watch me discuss this blog on WYFF4 this Sunday, August 16th during the 7 AM news. For those of you in other parts of the world, don't despair. WYFF4 posts the weekly interviews at Sound Off South! Last night I made fresh tomato salsa with the tomatoes and peppers from my parents' garden. Ah, the perks of house-sitting! I had to pick up some cilantro from the garden center, though. I'm trying to grow it indoors this time. I have had absolutely no luck growing cilantro in my herb garden. My friend's mom, from Charleston, told me that cilantro likes cool weather and doesn't do well for her in South Carolina. From what I've read, it's true that cilantro likes some shade and cooler temperatures. What I really don't understand, though, is how cilantro can be so popular in Tex Mex food. It's *hot* in Texas, right?